Official Aspire mods are designed with innovation, safety and usability in mind. As ever, we cater to a variety of different customers - including new starters, advanced users and those that simply must have a clock on their device. Aspire mods offer both vendors and end users a wide array of choice and abilities. Our Aspire mods come with a variety of different looks, styles, power ranges, technology and settings. You can’t say you aren’t spoilt for choice. All our Aspire Mods and batteries have a level of user safety, expected from a brand such as Aspire. It is a given that everyone has different tastes in design. That’s why Aspire make a range of mods that come in different styles. Some people prefer a more simplistic design, whilst others will prefer a more exciting and radical look. Our Aspire box mods offer you a number of choices. You could go for a more standard look and feel with the likes of the Aspire Zelos Mod - which comes in either black, silver or red with a rounded edge design! You could go for something more 'out there' with a fancy screen interface and wild colours? Or perhaps something small and stealthy. It’s up to you! Whichever feels best for you or your customers. For some customers, it is not always about the design. For some, it is all about power! The more wattage your mod can achieve means more power in your e-cigarette. Our Aspire box mod selection comes with a large range of maximum wattage devices, starting as low as 30 watts and going all the way up to 220 watts. Official Aspire mods are ideal for all types of vaping, from the chilled and relaxing NX Series to the hard hitting and powerful with the Dynamo Mod. As with many devices, the more technology that is built in – the better the settings and usability. 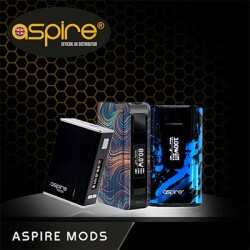 At Aspire we manufacture mods that are intended to provide the best customer usability possible. From the simplest of settings to the most cutting-edge additions, Aspire mods are known to be some of the best there is. Our Aspire box mod range allows you to choose from either the most basic or sophisticated of mods. We supply mods that have the more rudimentary fire button settings and a stealth mode. Then we have more powerful mods that feature the likes of a coloured screen interface, which you use to navigate through your data, time and customisable power settings with simplicity. Again, Aspire are at the forefront of mod battery safety and we have dedicated safety features built into all of our products. If you can’t decide on which Aspire box mod to choose, feel free to contact us by calling 0333 577 5002 (local rate charge) or emailing admin@officialaspire.co.uk. Aspire SkyStar Mod Just want the SkyStar mod on its own then you are in the right place. If y.. Aspire Dynamo Mod Presenting our most customizable mod yet, welcome then amazing Dynamo 220w .. Aspire NX 75 Mod The Aspire NX 75 fires up to 75 watts, looks amazing in the hand and has a simp.. Aspire NX30 Mod The perfect stealth mod is perfect for on the go vaping either during the daily c.. Aspire Speeder 200w Mod The all new, all powerful Aspire Speeder has entered the market. The Aspi..